92 x 36 x 18. Box has sliding clamps that adjust to crossbar spread and tighten down with cam-action levers. Dual-side-opening lid locks with SuperLatches. Dimpled texture reduces wind drag. Undercut tail provides hatch clearance. 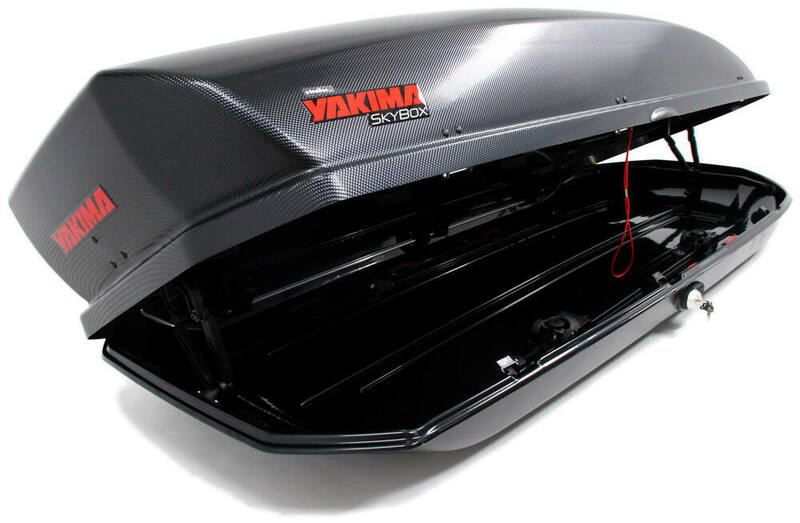 Lowest Prices for the best roof box from Yakima. Yakima SkyBox 21 Rooftop Cargo Box - 21 cu ft - Black Carbonite part number Y07337 can be ordered online at etrailer.com or call 800-298-8924 for expert service. 92 x 36 x 18. Box has sliding clamps that adjust to crossbar spread and tighten down with cam-action levers. Dual-side-opening lid locks with SuperLatches. Dimpled texture reduces wind drag. Undercut tail provides hatch clearance. Maximum crossbar dimensions: 3-1/2" x 1-11/16"
Crossbar spread: 24" - 42"
Note: Because of the size of this item, it ships truck freight. 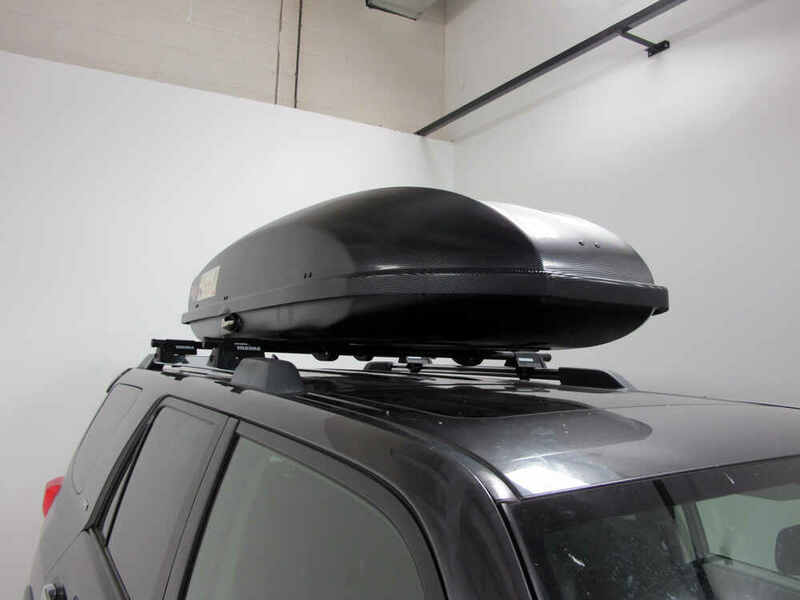 Cargo boxes, bags, and baskets are great for transporting gear on your vehicle's roof. 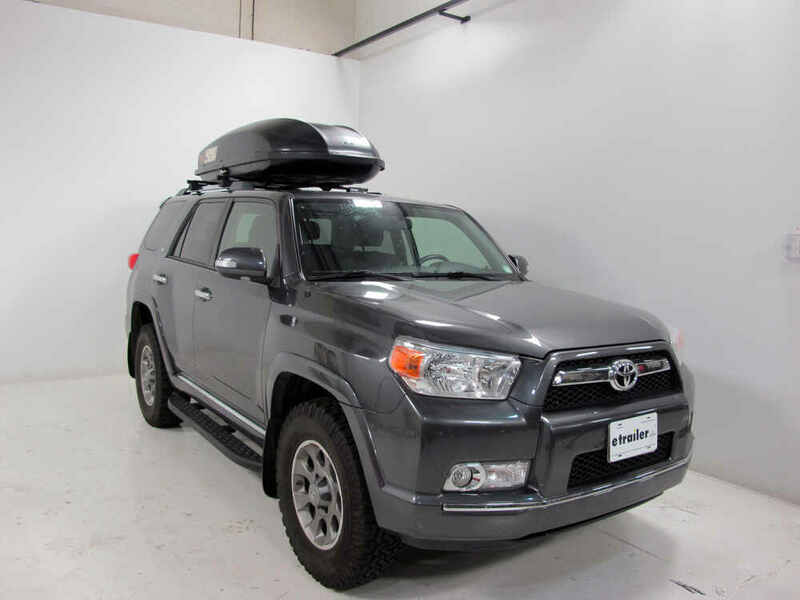 A cargo box has the added benefits of an aerodynamic shape that reduces drag and wind noise, a hard shell to protect your gear, and a higher degree of weather resistance. And you can latch and lock a cargo box for added protection against theft. The SkyBox 21 has 21 cu ft of space for sports equipment or camping gear for up to 4 people. The aerodynamic, low-profile design and the dimpled lid with Carbonite texture help to reduce wind noise and drag. 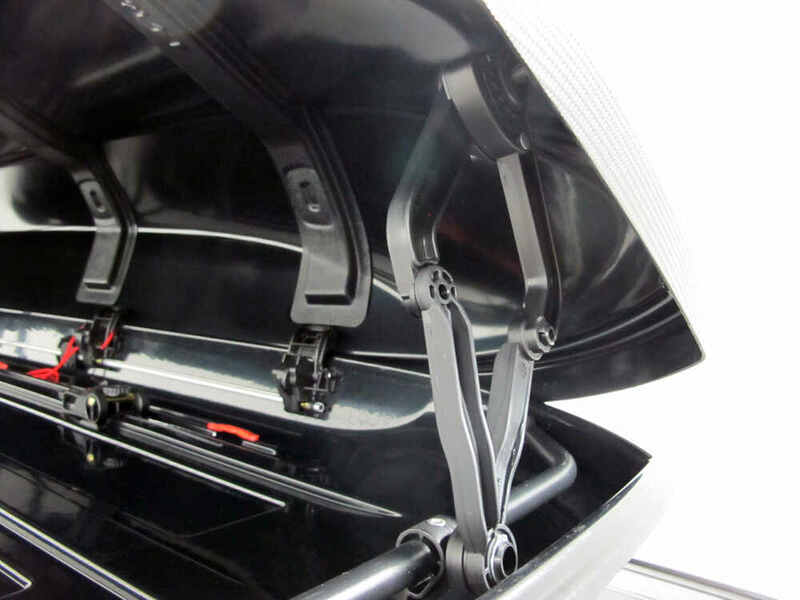 The box opens and latches from both sides and is designed to provide clearance when you open your rear hatch. Sliding clamps accommodate most crossbar styles and spreads so you can install the box in minutes without tools. 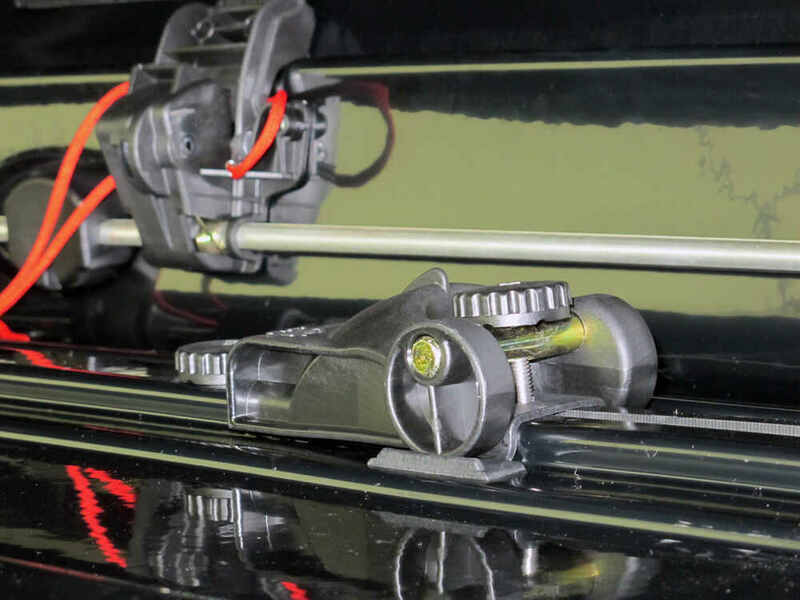 The durable yet lightweight ABS plastic construction prevents warping, denting, or cracking. The SkyBox lid opens from both sides. Whether you mount it closer to the driver's side or passenger's side of your car, this dual-side opening lets you easily access your cargo. 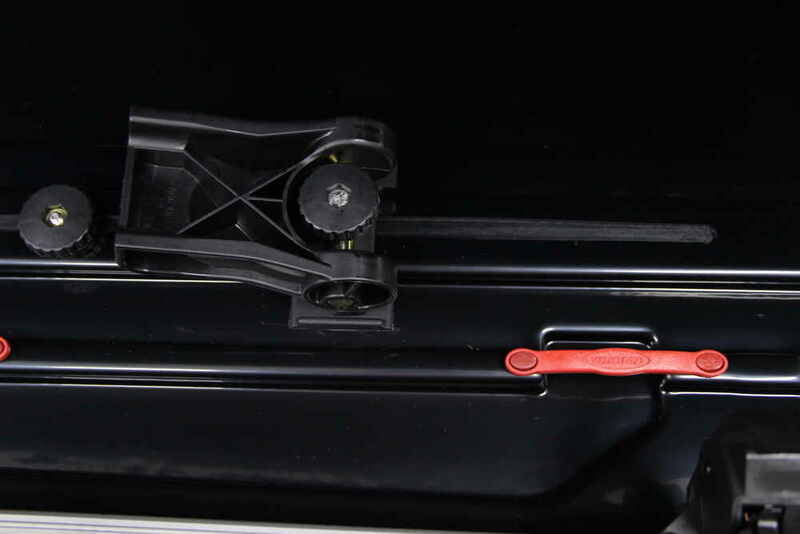 If you are parked on a busy street, in a tight parking lot, or even next to a campground picnic table, you have the option of opening the lid from the side of the vehicle that works best for you. 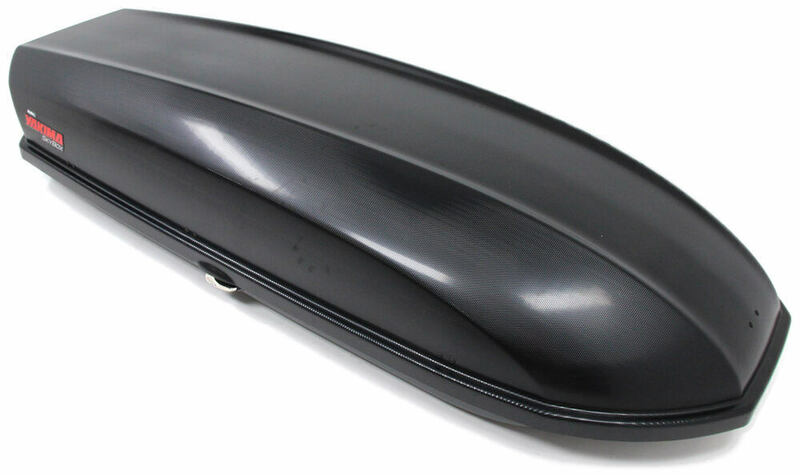 Patented EndoSkel stiffeners act like ribs to make this lid 3 times stiffer than other Yakima cargo box lids. The fortified lid has an easy-access edge and spring-loaded hinges that allow for smooth, one-handed operation. 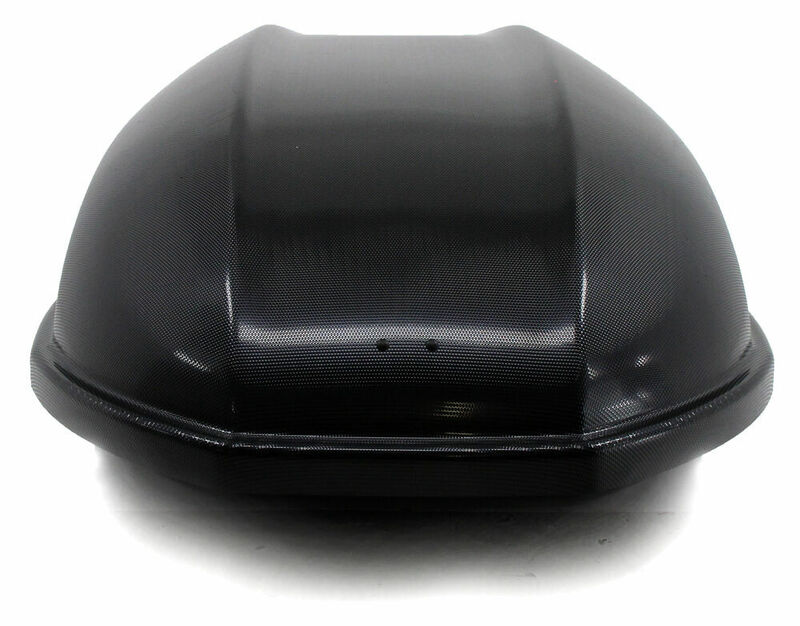 The extra-stiff lid also helps reduce road noise and vibration, and it guards against dents and scratches when the box is in storage. The SkyBox has SuperLatch security latches on both sides to ensure that the lid is completely closed. The SuperLatch prevents you from removing the key from the lock unless all 3 internal latches are engaged. That way, you are prevented from removing the key and driving off with an unlocked box. This security system also seals the box against dirt and moisture. Each SuperLatch includes an SKS lock core that can be swapped out to make all your Yakima gear keyed alike. The SkyBox installs with mounting clamps that slide along tracks in the floor of the box. These clamps fit most crossbar styles, and they adjust for different crossbar spreads. To adjust a clamp, loosen both knobs and slide the clamp to the desired location. Then tighten both knobs and push the cam lever down to close the clamp around your crossbar. 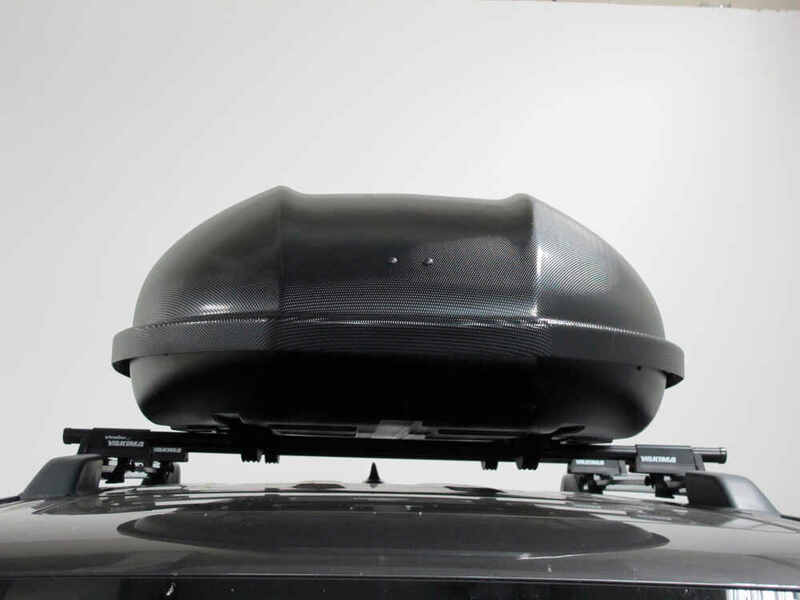 The SkyBox has an undercut tail designed to prevent interference with your vehicle's rear hatch or trunk. This tail provides more space for your hatch to fully open when compared with boxes without the undercut tail. 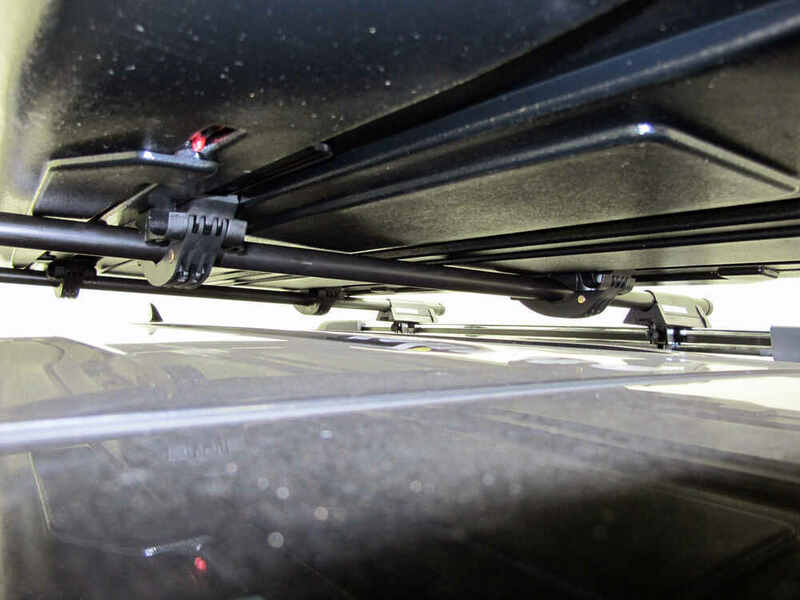 An integrated track system in the floor of the box provides tie-down points for securing your cargo. 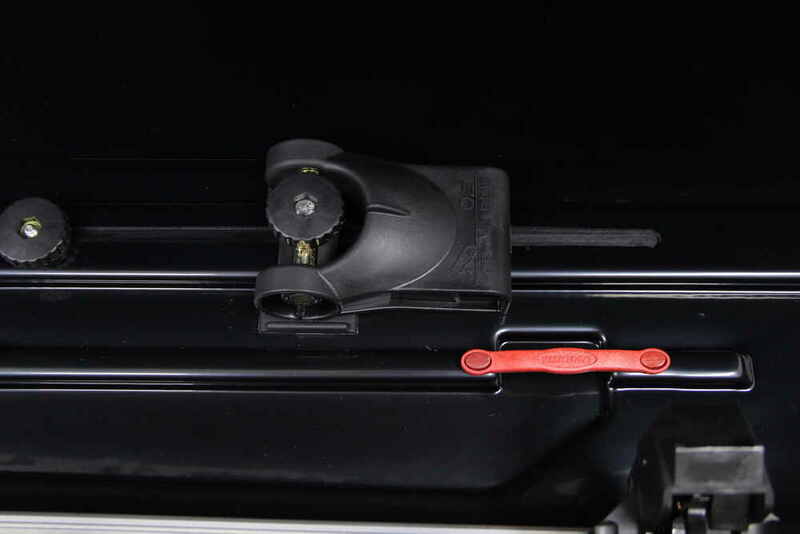 These anchor points work great with Yakima's SkyBox cargo net (Y07146 - sold separately). 8007337 Yakima Sky Box 21 Carbonite Cargo Box - 21 Cubic Feet - 92" x 36" x 18"
81 x 36 x 15. Box has sliding clamps that adjust to crossbar spread and tighten down with cam-action levers. Dual-side-opening lid locks with SuperLatches. Dimpled texture reduces wind drag. Undercut tail provides hatch clearance. 91 x 37 x 17. 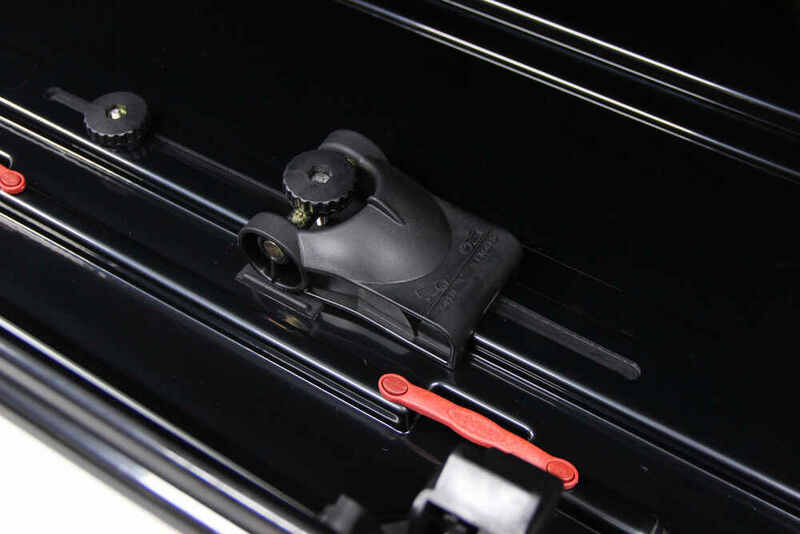 Roof box mounts to your crossbars with quick-release clamps. Locking lid opens from either side of your vehicle. Great for carrying skis, snowboards, and other gear on SUVs or full-size wagons. Durable ABS plastic construction. 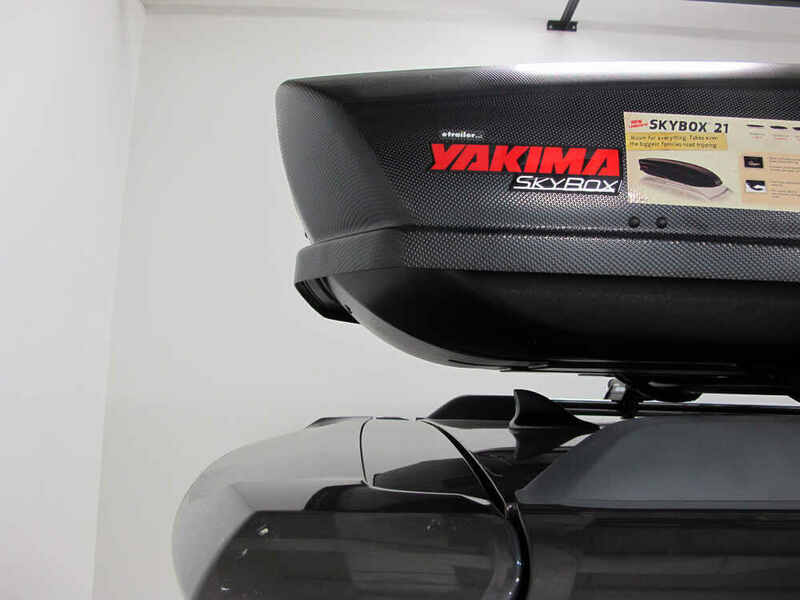 Today we'll be reviewing the Yakima SkyBox rooftop cargo box. This has the dimpled carbonite texture. It's going to be available in four different sizes. It's available in 21 cubic feet with part number Y07337. It's also available in 18 cubic feet with part number Y07336, 16 cubic feet with part number Y07335, and 12 cubic feet with part number Y07334. One of the first things that we noticed about the new Yakima SkyBox is that it has a nice carbonite dimpled effect to it. Gives it a nice clean smooth texture. It's going to be an anti-scratch finish. It's made with up to 80% recycled material and it has a really nice sleek, aerodynamic design so it's going to reduce wind drag and noise. Another great feature about this box is its ability to open from either side of the vehicle. All you got to do is place the key in, move it to an unlocked position, drop the latch down, and then open the lid on this side. We'll move to the driver side and show you that it opens just as easy from that side as well repeating those same steps. See here on our driver side, open it. Got the easy grip handle there. That way you can get a nice grip whether you're in wet, dry, or cold conditions. Then you can gain access to whatever you need to on this side of the box as well. Then when you're ready to close the box we have it installed on a little bit of a taller vehicle today. You can grab the easy pull-down strap, pull it down, tuck it back in the box, and then finish closing it. Now here on the inside of the box Yakima really does a good job at providing some tie-down points because we always want to make sure when hauling our cargo that we have it tied down so it doesn't roll around inside the box. On each side they put in a track system. It's going to have four tie-down points. That's what these red Yakima bars are. Again, there's going to be four on each side of the box. That way you can run straps over your gear or use a cargo net. Straps or a cargo net are going to be sold separately. It also features the Super Latch system. This is going to ensure that the box is closed before driving away so when we close the lid that latch comes up into place. If we try to remove the key it actually won't let us because our key is still in the unlocked position. We got to move it to a locked position and then it will remove. That's also going to give us the peace of mind that all of our gear is nice, locked into place, and fully secured. Here at the back of the box it has a nice sloped design. Now this is designed in mind to give you more room when opening your rear hatch door, but in our particular situation today when opening it, it does not allow us full access to the rear hatch door but it does give us some clearance. Just in mind that this will vary depending on your vehicle. 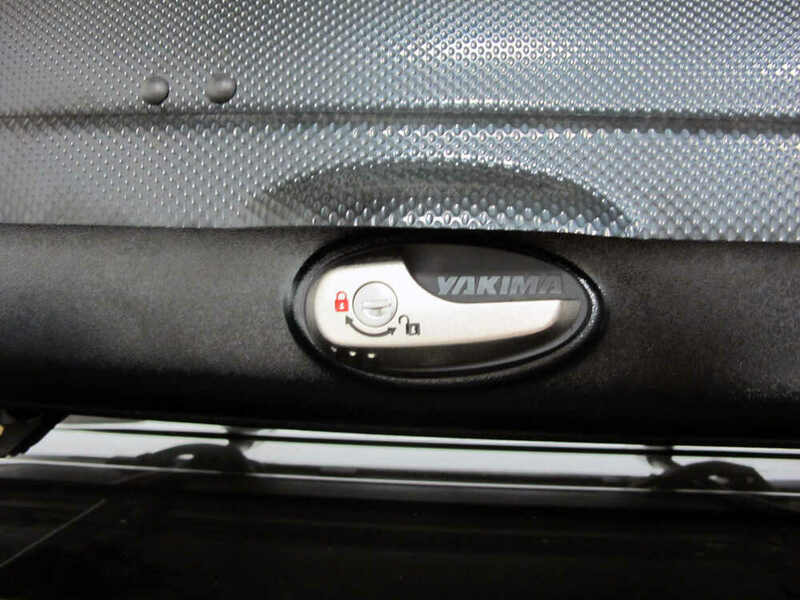 The Yakima SkyBox with 21 cubic feet has external dimensions of 92" long by 36" wide by 18" tall. The 18 cubic foot box is going to have dimensions of 92" long by 36" wide by 16" tall. The 16 cubic foot box is going to be 81" long by 36" wide by 15" tall. Then the box that measures 12 cubic feet is going to give us measurements of 92" long by 24" wide by 16" tall. This box is going to feature a flat base that's going to allow for easy on-car adjustment. It also has two same-key Same Key System locks. That secures the gear inside the box and it's going to lock the box to the roof rack crossbars. 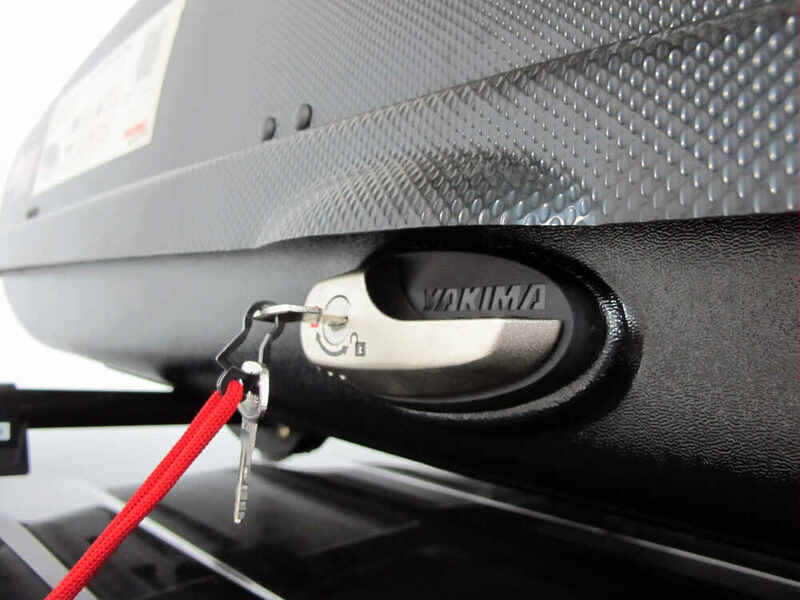 The Same Key System cores can be changed out to make all your Yakima locks keyed alike. 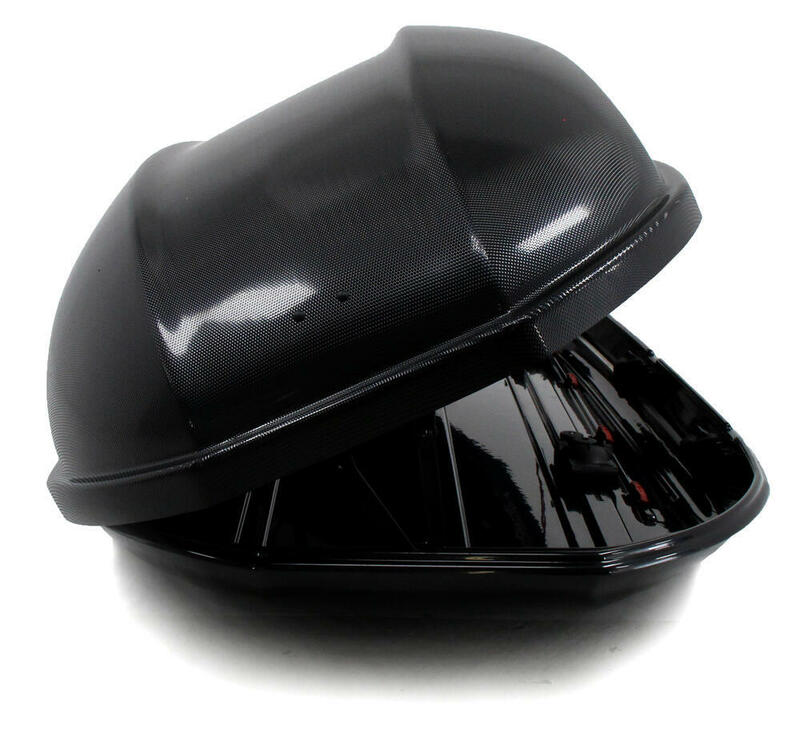 It's made from a durable ABS plastic construction with internal lid stiffeners for extra strength. This is designed to work with round, square, aero, elliptical, and most factory crossbars. You just need to make sure that the crossbar spread is between 24" and 42". For the rear hatch door to open fully with the box installed keep in mind that there must be at least 57" between the center of the front crossbar and the line where the roof and the rear hatch door meet. Securing your gear inside the box is very important. You can do that with the Yakima SkyBox cargo net that's going to be sold separately with part number Y07146. Or you can use some tie-down straps from Yakima, part number Y05006. You can find both of those right here at etrailer.com. Yakima's going to support the box with a lifetime warranty. Another great feature is how easily the box installs. All we have to do is set it up on top of our roof rack and then we'll be able to adjust it as necessary to get our feet around our bars. We need to gain access to the inside of our box, and in order to do that we'll just place the key inside of the lock core, move it to an unlocked position, release the super latch. The box lid easily opens with the use of one hand because of the nice spring-loaded hinge design. We need to make sure that our feet are around our crossbars. Then here on the inside we can tighten them down. The rear thumb dial is going to secure the sliding part of the mechanism in place to make sure it doesn't slide around. We'll tighten that down and then we're going to tighten that other thumb dial just a little bit, and then rely on the cam-action lever to finish securing it in place. We'll move to the back and do that same process. Then we can move to the other side of the box and repeat that process. 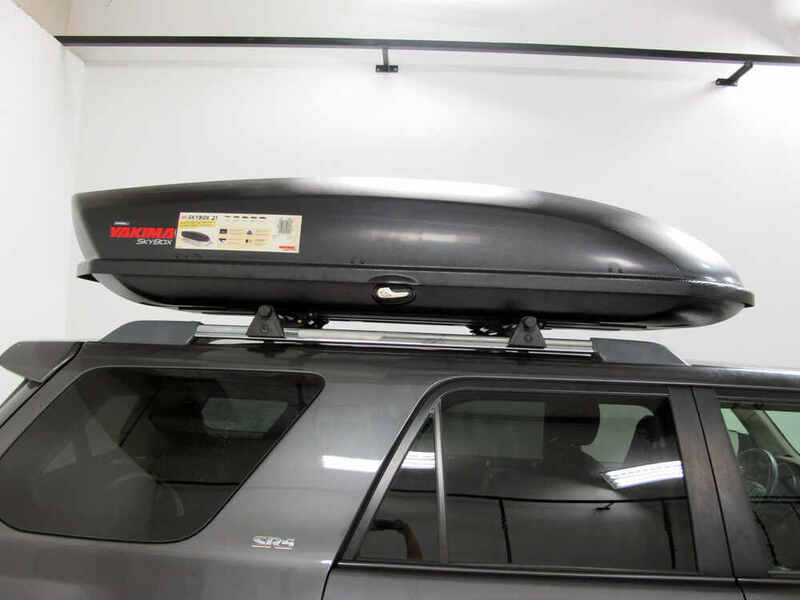 That's going to complete today's review of the Yakima SkyBox rooftop cargo box. .
Order: RelevanceNewestRating - High to LowRating - Low to High 92 x 36 x 18. Box has sliding clamps that adjust to crossbar spread and tighten down with cam-action levers. Dual-side-opening lid locks with SuperLatches. Dimpled texture reduces wind drag. Undercut tail provides hatch clearance. It is a great addition for long trips. Good construction! The Malone AirFlow2 is a good choice for your 2011 Subaru Forester. I recommend the 58 inch bar version, part # MPG216. 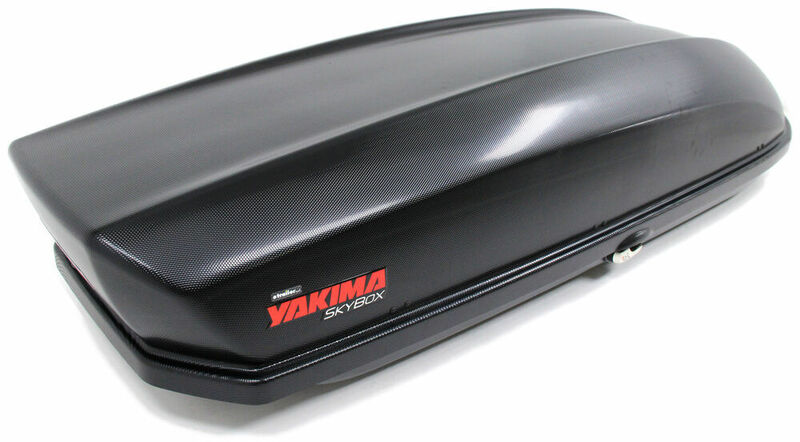 A Yakima roof box, like the SkyBox 21 # Y07337, will fit just fine on the AirFlow2. The bars on the AirFlow2 should be spaced about 27-1/2 inches apart and the SkyBox fits a crossbar spread of 24 to 42 inches. I contacted Yakima and the rear support you need for the Yakima Skybox 21 part # Y07337 is part # 8880683. The older version of the Skybox 21 did use the two arm rear support but you can replace the older two arm version with the updated single arm support. The Replacement Seal Strips for Yakima SkyBox Series Rooftop Cargo Box 2006 and Newer - Qty 4 # 8870086 is a fit for 2006 boxes and newer. It will fit models # Y07337, # Y07336, as well as the discontinued boxes Y07198 and Y07197. Your 2018 Ford Fusion with the Yakima Jetstream roof rack will have a capacity of 125 lbs and a crossbar spread of 32 inches. You will be able to use the largest box available as long as you don't overload it with weight. 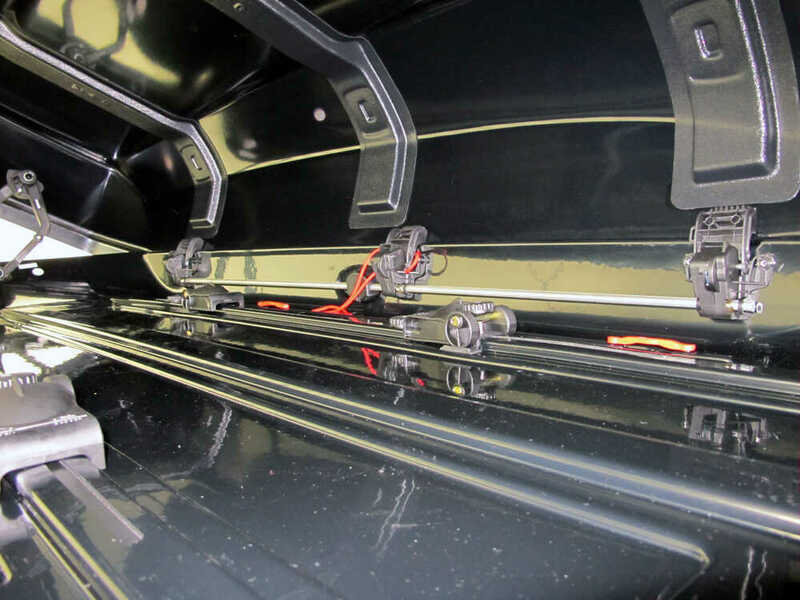 You may be interested in the Yakima SkyBox 21 Rooftop Cargo Box - 21 cu ft # Y07337, the Thule Force XT Rooftop Cargo Box - 22 cu ft - Black AeroSkin # TH6359B, or the Thule Motion XT # TH6299B or # TH6299T.